In the entirety of American political history, there has never been a good idea that stemmed from a late-night talk show. Talk shows are for stupid pet tricks, evolution of dance segments and odd recurring characters. So the idea that a debate between Bernie Sanders and Donald Trump was essentially passed like a junior high note from Jimmy Kimmel to the Republican nominee Wednesday night had “bad idea” written all over it from the start. This debate degrades the primary, makes Sanders look foolish and helps Trump’s chances of reaching the White House. If that doesn’t qualify Trump-vs.-Sanders as one of the most disturbing and dangerous events of this election year, then you haven’t been paying attention. This whole fiasco begins, not surprisingly, with Sanders. Sanders of the relatively good ideas, limited legislative accomplishments and insufferable audacity to think he’s being excluded from a club he never belonged to. That Sanders. The Sanders campaign has long complained that the Democratic National Committee, run by Hillary Clinton’s “BFF” Debbie Wasserman Schultz, organized only a few debates and at awful times to protect Clinton. With the chance of getting the Democratic nomination all but mathematically impossible, Sanders has been attempting to cajole and then shame Clinton into debating him one last night before the California primary June 7, which essentially wraps up the Democratic race. Clinton has refused, and Sanders, knowing that we are headily edging toward the “bust” part of the #BernieorBust campaign, hatched an idea. If Clinton won’t debate him, then perhaps Trump will. Trump at least so far has indicated that he would be happy to debate Sanders … for a price. I want to make it clear that I’m not some stickler for tradition. I think that shaking up the electoral process is generally a good thing. Last year, when there were 17 Republicans running for the nomination, I suggested breaking them up into NCAA-basketball-style brackets. I believe that third parties and independents have an important role to play in our democracy. I also know crazy political Hail Marys when I see them. The attempt by Sanders, knowing full well that he won’t be the Democratic nominee, to debate Trump is about as much a political stunt as Ted Cruz picking Carly Fiorina as his vice presidential candidate when he was trailing Trump by 200 delegates. The desperate Sanders campaign wants the American public to conflate strategy with its “rigged system” rhetoric. Late in the primary, candidates in the lead never want to debate because all they’re doing is giving their opponent a chance to get onstage with them, look legitimate and score some points. Obama rebuffed Clinton’s calls for more debates in 2008, Trump refused more debates with Cruz in April and now Clinton doesn’t want more debates with Sanders. Avoiding more primary debates isn’t an act of cowardice; it’s good strategy. There have been six televised debates, countless speeches and interviews, and a year of campaigning. After all of that, the majority of Democratic primary voters chose Clinton. To suggest that one more debate would make a difference is like saying a few more hours in the studio would’ve saved Kanye’s last album. Both ideas are pipe dreams. But here is where the pipe dream becomes a nightmare. Sanders’ plan to debate Trump plays right into the GOP nominee’s hands because it legitimizes and “normalizes” Trump’s behavior. This is a man who said he is happy to do a debate because it will have huge ratings, but only if Sanders or the networks pay him for it. The fact that Trump wants to nominally give the money to charity means nothing (just ask the veterans). However, giving Trump a stage to “look” presidential is the first step to his winning over low-information independent voters. Sanders may think that he’ll slam Trump and call the GOP front-runner out on his various violent and dangerous policies, but the bigger takeaway will be that Trump was given a national stage with incredible ratings to debate someone he won’t actually have to face in November. This debate is like when you have a creationist “debating” an evolutionary biologist. Just allowing for the debate implies that these two positions are equally worthy of discussion, when everything from the birds in the sky to Jurassic World says they are not. On Jimmy Kimmel, the GOP front-runner said that he’d “love” to debate Sanders because “he’ll be easier to beat than Clinton.” Which might be the only honest thing Trump has said in months. He will win any debate he has with Sanders because they are not looking to get the same thing out of the debate. 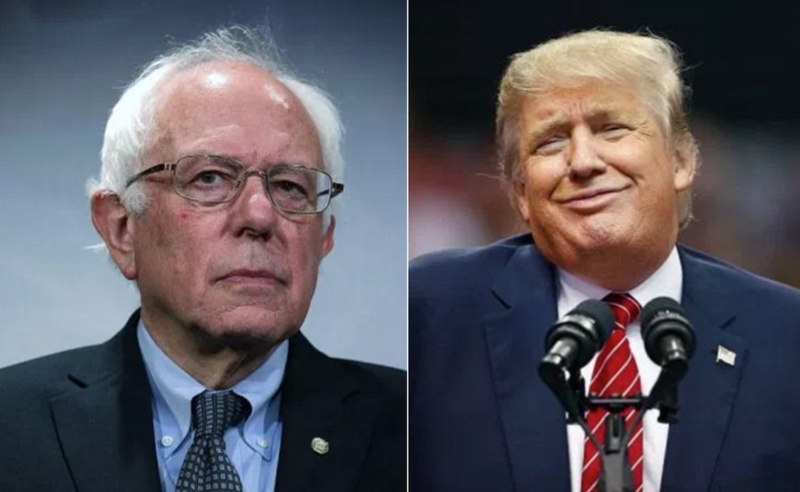 Sanders is making a last-ditch attempt at a primary victory he won’t get, while Trump is playing a long game of being a corrupt carnival barker who is trying to trick the American people into thinking he’s qualified to run the most powerful nation in the world. And Sanders, should he push through with this debate, is making that reality all the more likely. In that scenario, no one wins but Trump.